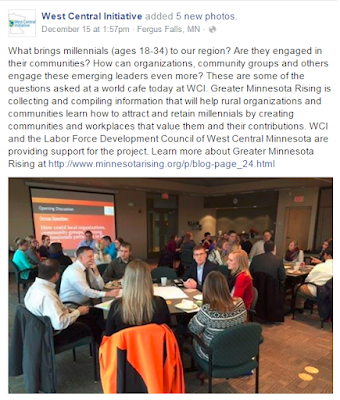 An initiative of Minnesota Rising, Greater Minnesota Rising is a research and community engagement project in North Central (Cass, Crow Wing, Todd, Wadena, and Morrison counties) and West Central Minnesota (Clay, Becker, Wilkin, Otter Tail, Grant, Douglas, Stevens, Pope, and Traverse counties). 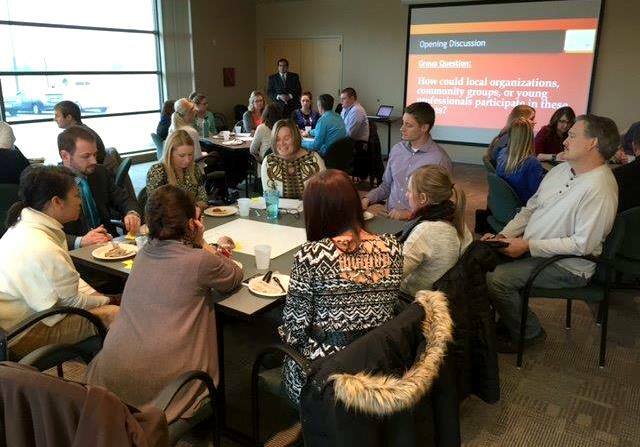 From April 2015 – February 2016, the project team sought to outline the region's assets and challenges related to workforce needs and community vitality and develop recommendations for engaging local emerging leaders and community organizations in northwestern Minnesota. The Greater Minnesota Rising research project was conducted in collaboration with Raising The Bar LLC, with support from the Central Lakes Regional Sustainable Development Partnership, Mary Page Community-University Partnership Fund, the West Central Initiative Foundation, and the Initiative Foundation of Little Falls, MN. The project was also supported in part through student research assistance provided by the Community Assistantship Program, a program of the University of Minnesota’s Center for Urban and Regional Affairs (CURA). Chet is a Regional Labor Market Analyst for the Minnesota Department of Employment and Economic Development, and currently lives in Nisswa, Minnesota. In this role, Chet supports local workforce and economic development councils as the state’s primary regional resource for labor market information; including demographic, employment and industry analysis for program planning and implementation. As a newcomer to the Northwestern Minnesota, Chet is regularly engaged with community stakeholders on a personal and professional basis throughout his 26 county region. His experience and knowledge from this transition provides an insight to multiple perspectives, and will add value to building a collaborative process. Outside of DEED, Chet serves his community as a Civil Affairs NCO in the Minnesota National Guard. He completed a Master of Public Policy degree fromthe Humphrey School of Public Affairs inMay 2013, with a focus on public leadership and non-profit management. Brooke McManigal is the summer research assistant on the Greater Minnesota Rising Research project sponsored by the University of Minnesota’s Center for Urban and Regional Affairs Community Assistantship Program (CURA CAP). She is conducting research about emerging leaders and community engagement in Northwestern Minnesota with the Minnesota Rising team. 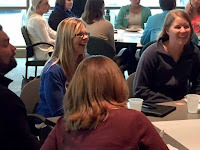 Brooke also works part-time at the Federal Executive Board of Minnesota, a small federal agency that focuses on intergovernmental collaboration and connecting Federal executive leaders. She is also attending the University of Minnesota Humphrey School of Public Affairs where she will be receiving her Masters in Public Policy in May of 2016, and is also a Humphrey Fellow. Her focus is on global policy and quantitative analysis, and she will be completing a capstone in global policy in the fall. In addition to her involvement with Greater Minnesota Rising, Brooke acts as the organizer of a softball league through the Minneapolis Parks & Recreational Park and a participant in a kickball league through City Sports Connection. David Milavetz is the President of Raising The Bar LLC, an independent consulting firm, and has experience conducting evaluation and research within community, nonprofit, and informal education settings. He is particularly interested in using evaluation to support organizations and programs in creating their desired impact. David earned a Master of Public Policy with emphases in public leadership and nonprofit management from the Hubert H. Humphrey School of Public Affairs at the University of Minnesota and a BA in International Studies from the University of Denver. David is a recipient of the 2013 University of Minnesota President's Student Leadership and Service Award and 2010 University of Denver Profiles of Excellence Award. Currently, David is completing a Program Evaluation Certificate through the University of Minnesota's Organizational Leadership, Policy, and Development department. Strategic planning research, policy analysis, grant-writing and community engagement lie at the foundation of Andrea's experience. She is passionate about helping organizations and communities evaluate and maximize their impact in the context of their strategic visions and has experience doing so with nonprofit organizations in the US and globally. Diane Tran is System Director of Neighborhood Integration for HealthEast Care System. She most recently served as a Senior Project Manager at Grassroots Solutions, a national consulting firm specializing in grassroots strategy, organizing, training, and evaluation. Prior to that, she directed Minnesota field activities for the Pew Charitable Trusts’ program to advance federal clean energy policies. Previously, Diane coordinated a local public health advocacy campaign to advance the Freedom to Breathe Act of 2007, a statewide smoke-free workplace policy protecting Minnesotans from the harmful effects of secondhand smoke. Diane serves on the boards of the Minnesota Humanities Center, GiveMN, and Minnesota Philanthropy Partners, and is a Past Chair of the board of directors for the Citizens League. She was selected as a 2013 German Marshall Memorial Fellow, named one of Ten Outstanding Young Minnesotans in 2008 by the Minnesota Junior Chamber, and served as a 2006-2007 Humphrey School Policy Fellow. Diane earned a self-designed bachelor’s degree in International Social Policy with a double major in Humanities at The College of Saint Scholastica in Duluth, MN. She is the founder of Minnesota Rising, a statewide network of emerging leaders, and blogs about civic leadership and the Millennial generation at www.MinnesotaRising.org. They are pieces of advice so that I can solve some problems. Would you mind uploading more posts?